The perception of the English as Foreign Language (EFL) teachers in Kingdom of Saudi Arabia (KSA) is extremely crucial since their perceived views regarding the commercial English learning textbooks plays a major role in framing their attitudes towards such textbooks. These textbooks are published by different international publishers and used extensively in EFL programs around the globe. Moreover,attitudes do influence language learning. 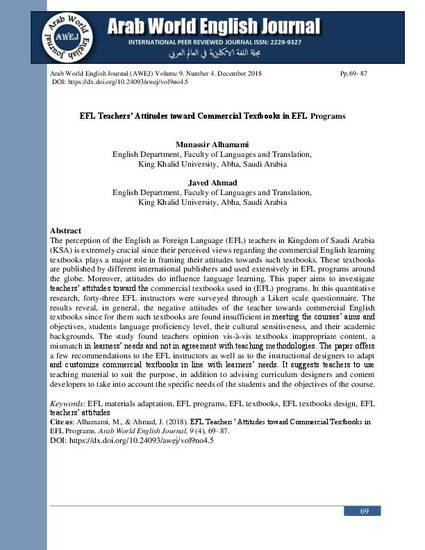 This paper aims to investigate teachers’ attitudes toward the commercial textbooks used in (EFL) programs. In this quantitative research, forty-three EFL instructors were surveyed through a Likert scale questionnaire.  The results reveal, in general, the negative attitudes of the teacher towards commercial English textbooks since for them such textbooks are found insufficient in meeting the courses’ aims and objectives, students language proficiency level, their cultural sensitiveness, and their academic backgrounds. The study found teachers opinion vis-à-vis textbooks inappropriate content, a mismatch in learners’ needs and not in agreement with teaching methodologies. The paper offers a few recommendations to the EFL instructors as well as to the instructional designers to adapt and customize commercial textbooks in line with learners’ needs. It suggests teachers to use teaching material to suit the purpose, in addition to advising curriculum designers and content developers to take into account the specific needs of the students and the objectives of the course.